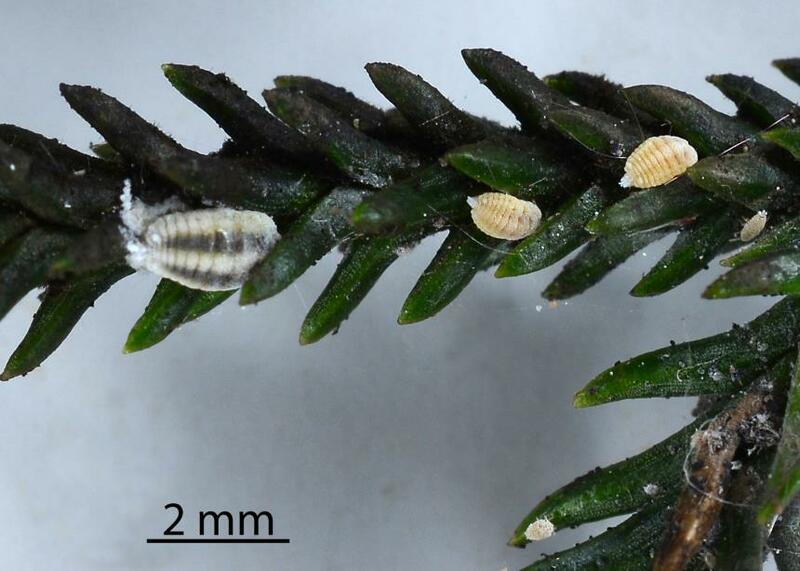 The endemic Kahikatea mealybug was named in 1938 from females found on White pine/Kahikatea, Dacrycarpus dacrydioides and was later found on Rimu, Dacrydium cupressinum, both plant species are in Podocarpaceae. 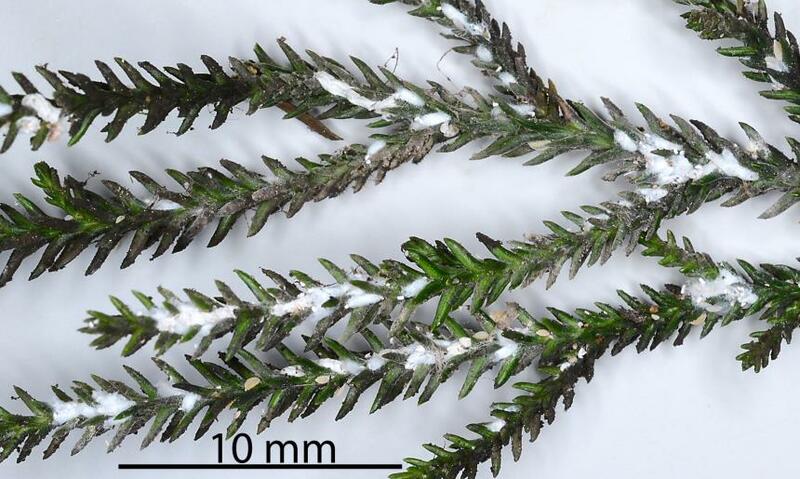 It is found in the North and South Islands in native habitats and on trees in parks. 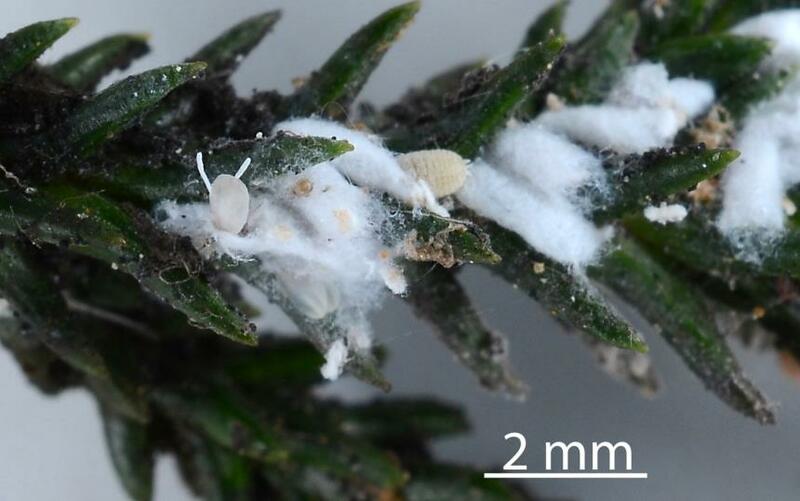 Conservation status: This native mealybug is found trees throughout in native ecosystems and parks. 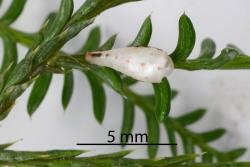 The Kahikatea mealybug breeds all year. There do not appear to be discrete generations. 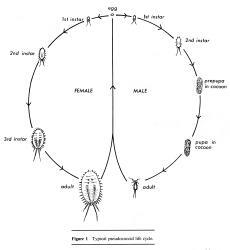 It is not known how long it takes from egg to adult. All stages live amongst the leaves of its host plants. The adult female is oval, about 2 mm long and 1 mm wide. It is yellow-brown with two long broad dark areas on its dorsum (top). 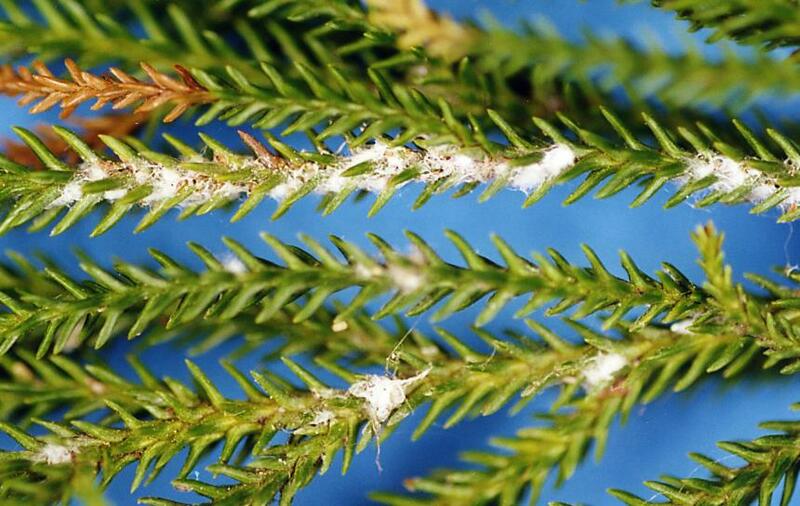 There are tiny white wax specks on the dorsum that eventually cover the whole body with white wax. 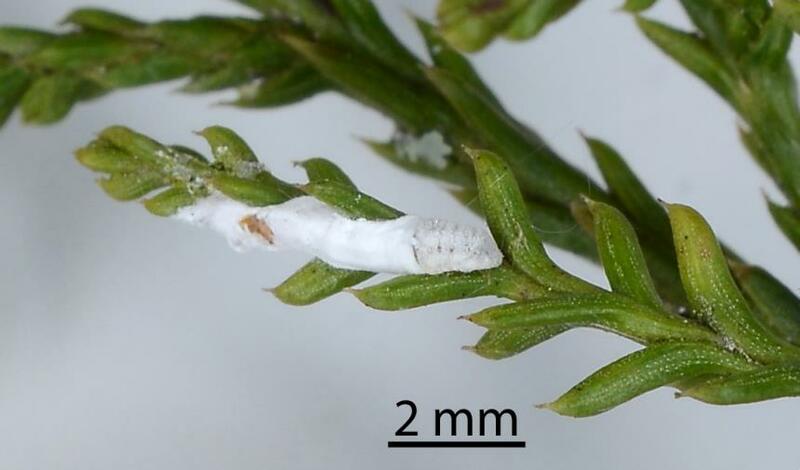 There is a terminal pair of white wax filaments. 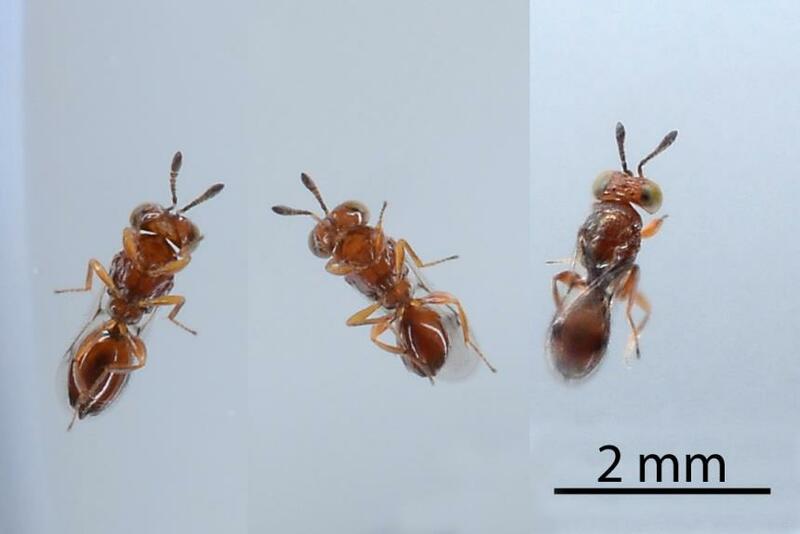 The mature female has a pair of short antennae and three pairs of legs. There is no distinct division between the head or thorax (middle section of the body) and abdomen. 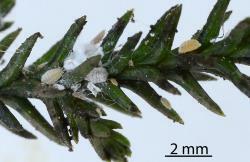 On the underside of the body there is a short rostrum that guides the feeding stylets. 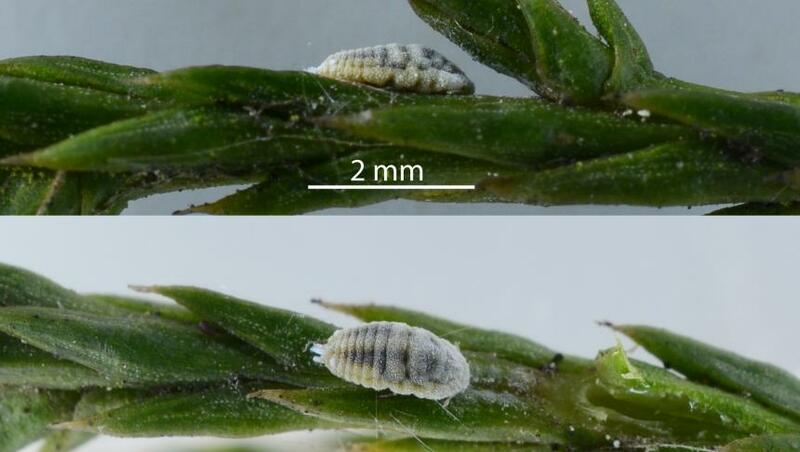 After mating and when it is fully grown, the female mealybug settles on a young shoot and produces a white fluffy wax chamber at the rear end of its body. 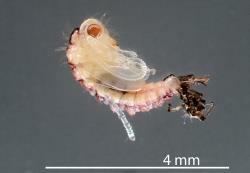 It lays orange coloured eggs into the egg sac. 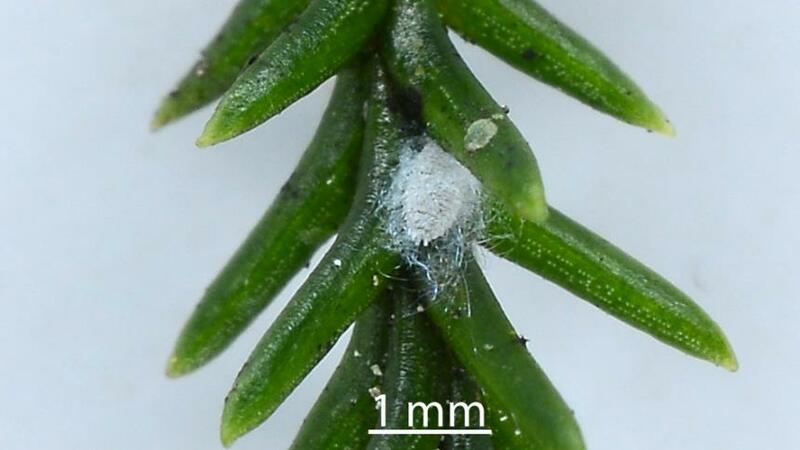 As it fills up, the female mealybug moves forward making the sac bigger as it continues to lay more eggs. The adult male has legs and wings. It can walk around the stems where its cocoon was and it can fly to other stems or to different trees. 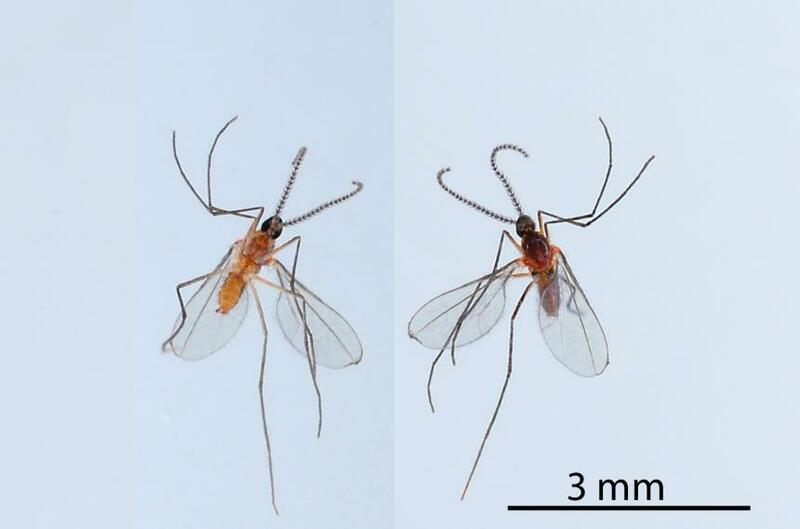 Adult females and nymphs also have legs and can walk. They may move about the group of stems where they were born. In other insects with a none flying adult female, the first stage larvae or nymphs are able to disperse to new trees. They usually do this using the wind. 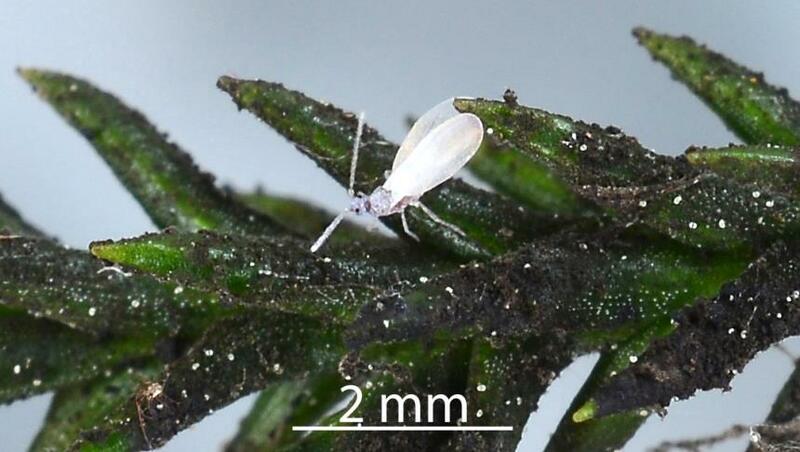 It is likely that some first instar nymphs climb to a prominent place on a leaf or branch and await a gust of wind. 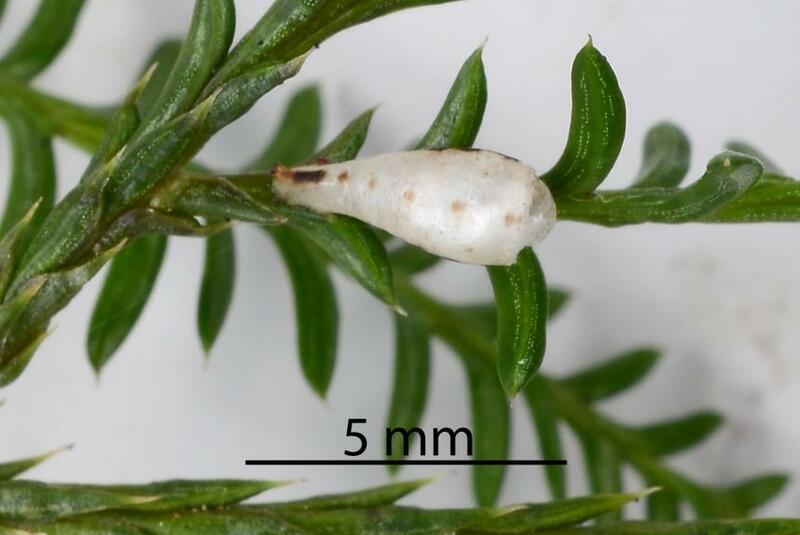 The Kahikatea mealybug is the only mealybug found on Kahikatea, Dacrycarpus dacrydioides and Rimu, Dacrydium cupressinum (Podocarpaceae). 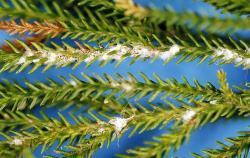 It is most easily recognised by the presence of the long white egg sacs on young stems. 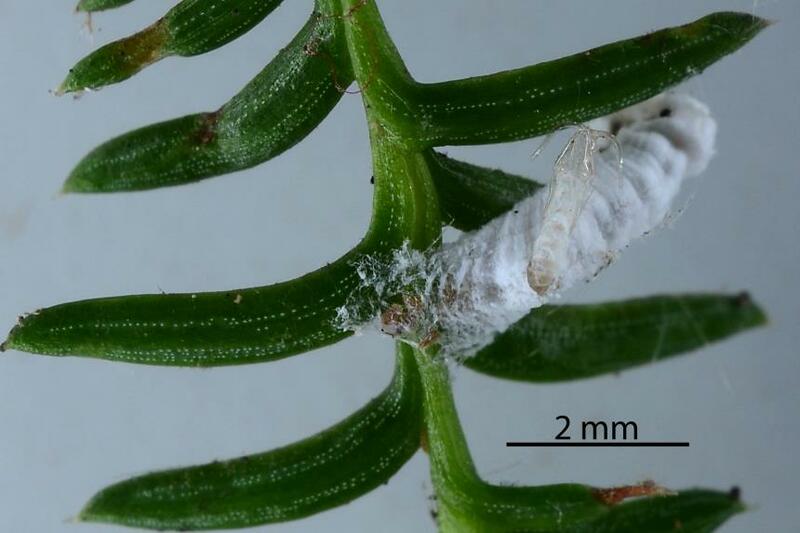 The mass of white male cocoons can also alert a person to the presence of the mealybugs. 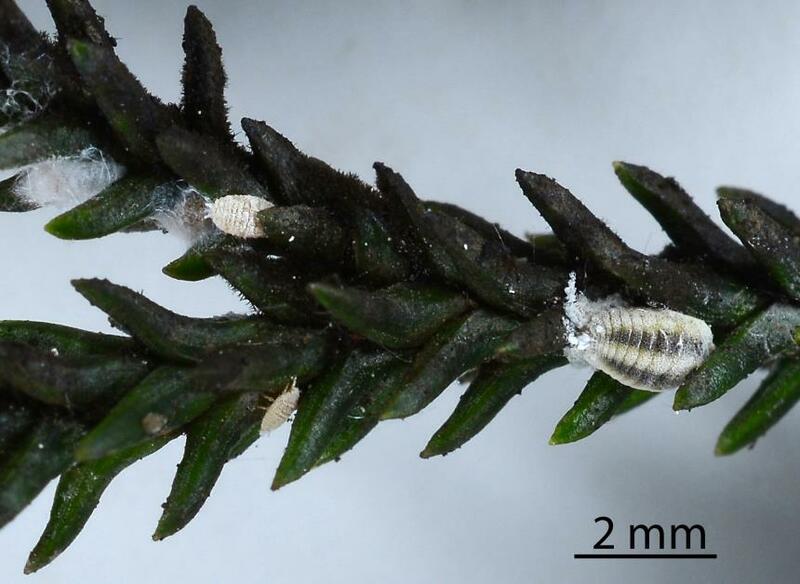 The juveniles of another scale insect, the Pyriform scale, Symeria pyriformis (Maskell, 1879) (Diaspididae) may produce a lot of flocculent wax that may superficially look like the mealybug cocoons. 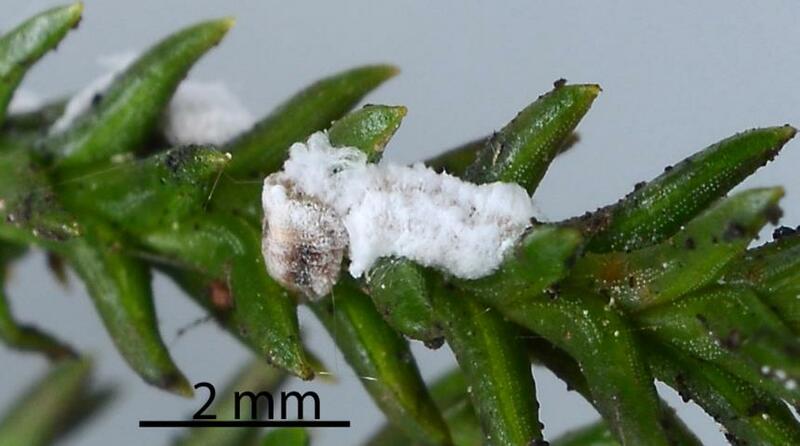 No pathogens or parasitoids of the Kahikatea mealybug, Paraferrisia podocarpi, are known. 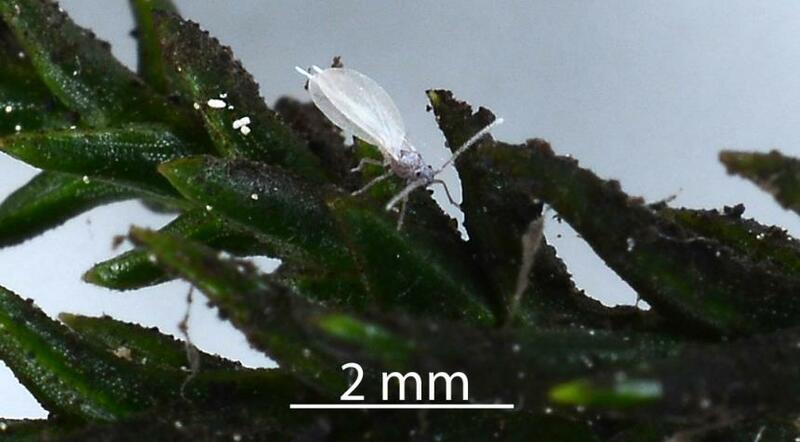 Several predators have been observed feeding on the mealybugs or have been reared from their egg sacs. 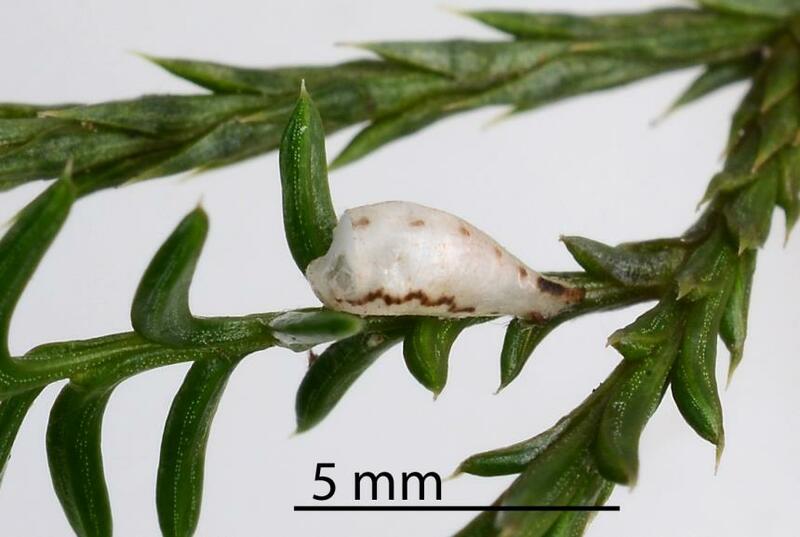 A tiny wasp (Hymenoptera) is a predator of the Kahikatea mealybug, feeding on the eggs. 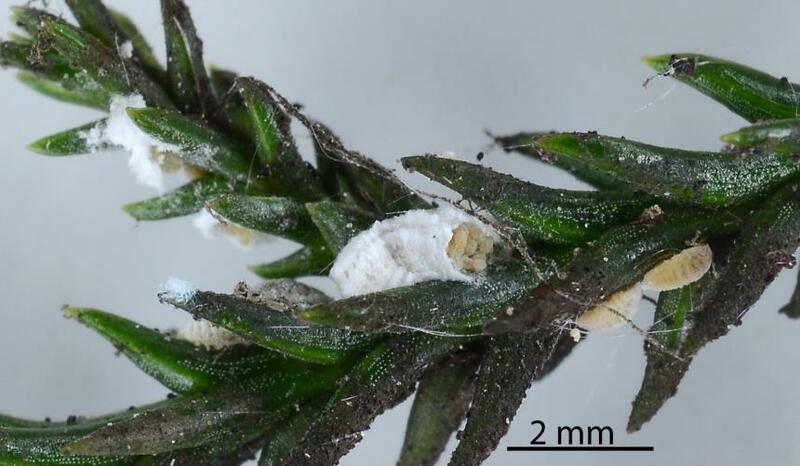 The female wasp lays an egg in the mealybug egg sac. 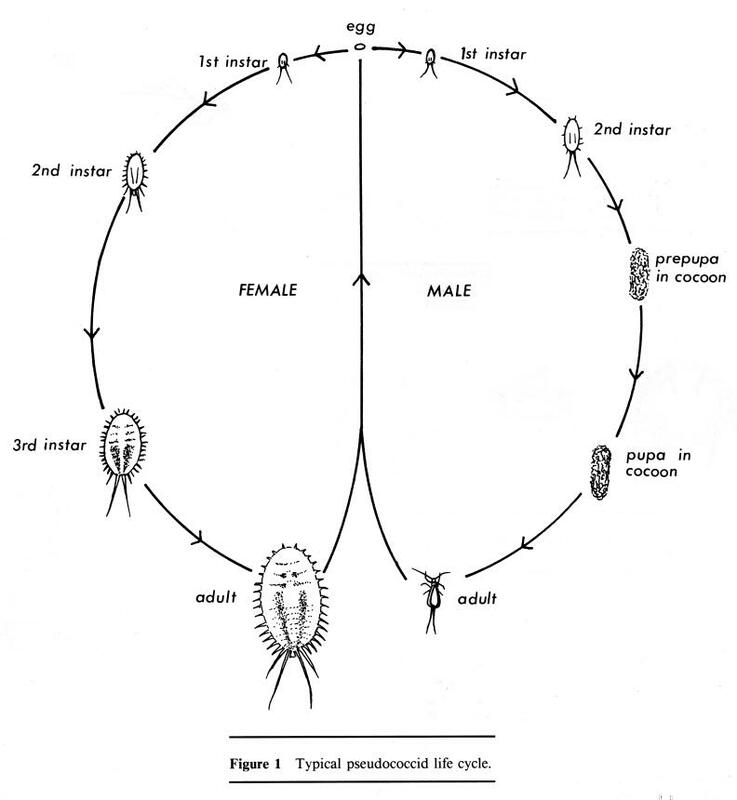 After hatching the larva feeds on the eggs. 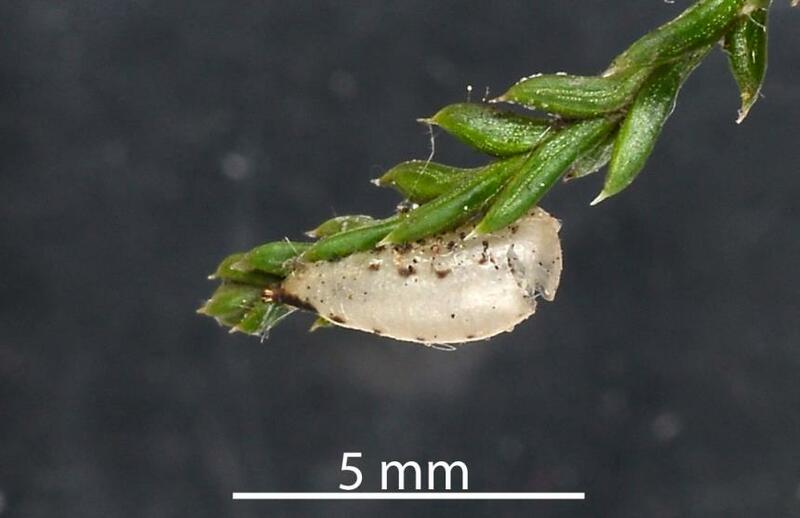 When the wasp larva is fully grown it pupates in the egg sac. 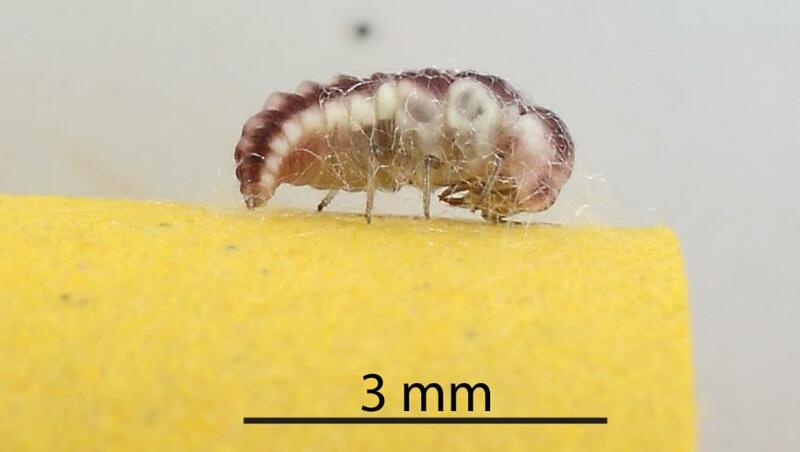 The larva of a predatory fly (Cecidomyiidae) also feed on the mealybug eggs. 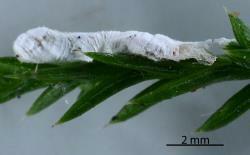 It also pupates in the egg sac. 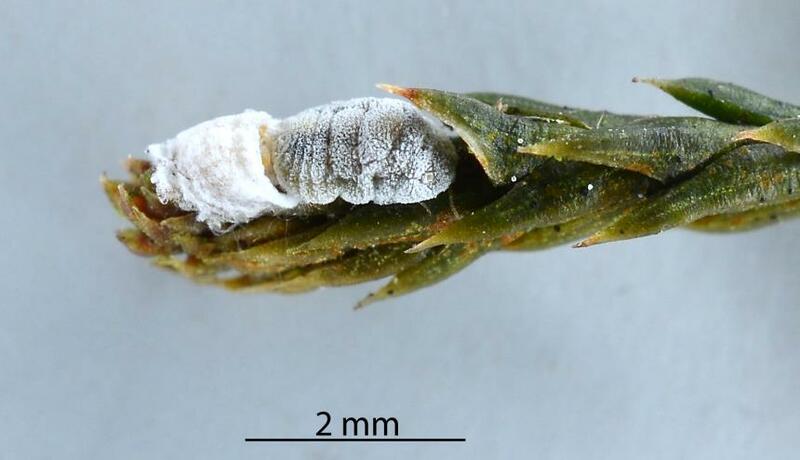 When the adult is ready to emerge, the pupa pushes through the wall of the egg sac. 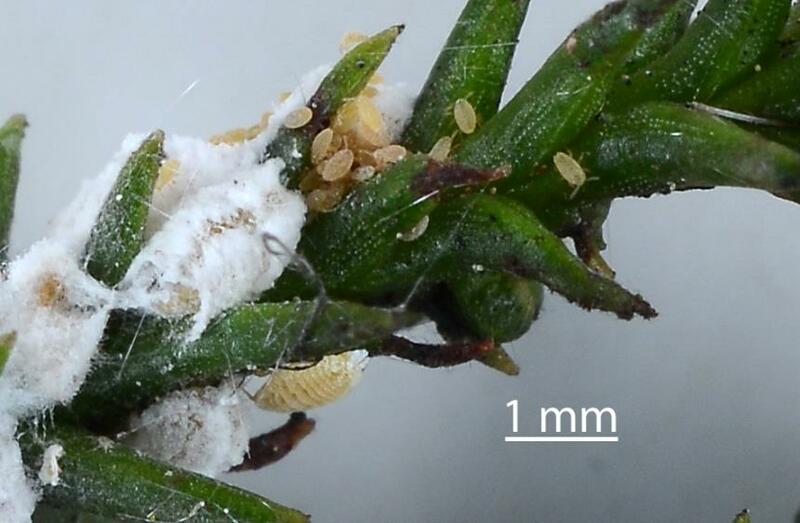 After the adult fly has emerged, the pupal case is left attached to the mealybug egg sac. 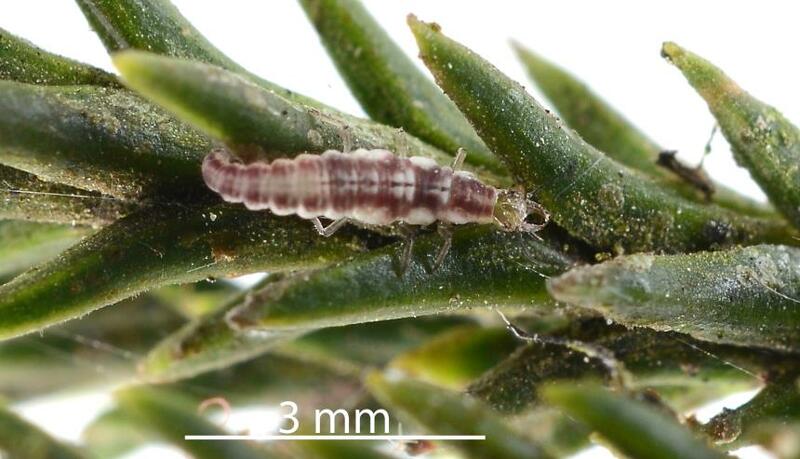 Many Mealybug ladybird larvae were seen on a tree and observed eating the mealybugs. 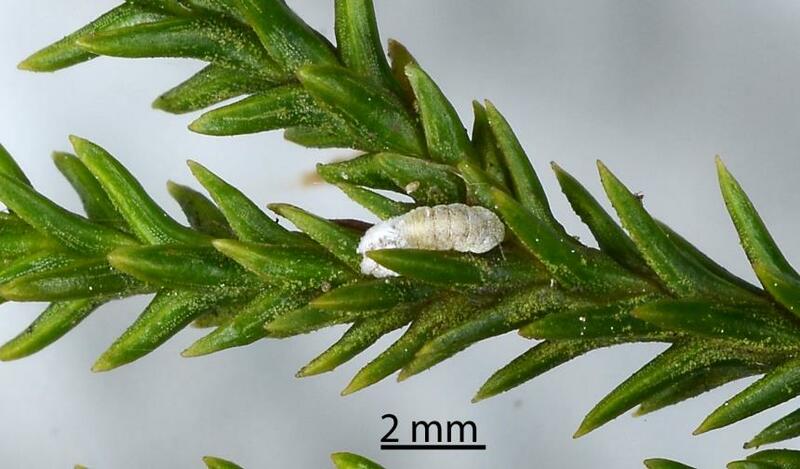 It is likely that a hoverfly (Syrphidae) and a lacewing (Neuroptera) are also predators of the Kahikatea mealybug, but have not been observed feeding on the mealybug. Table: Predators of Kahikatea mealybug, Paraferrisia podocarpi (Hemiptera: Pseudococcidae), from Plant-SyNZ database (3 February 2018). The reliability index shows the quality of evidence for the host association (0-10, 10=high quality). 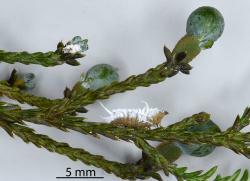 Larva of a lacewing (Neuroptera) on a stem of Rimu Dacrydium cupressinum (Podocarpaceae) that may be feeding on Kahikatea mealybugs, Paraferrisia podocarpi, (Hemiptera: Pseudococcidae. Larva of a lacewing (Neuroptera) on a stem of Rimu Dacrydium cupressinum (Podocarpaceae) that may be feeding on Kahikatea mealybugs, Paraferrisia podocarpi, (Hemiptera: Pseudococcidae). Prepupal larva of a lacewing (Neuroptera) that may have been feeding on Kahikatea mealybugs, Paraferrisia podocarpi, (Hemiptera: Pseudococcidae). 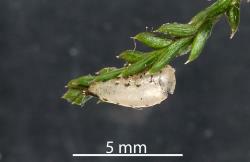 Pupa of a lacewing (Neuroptera) whose larva may have been feeding on Kahikatea mealybugs, Paraferrisia podocarpi, (Hemiptera: Pseudococcidae): note the moulted larval skin at the tail end of the pupa. 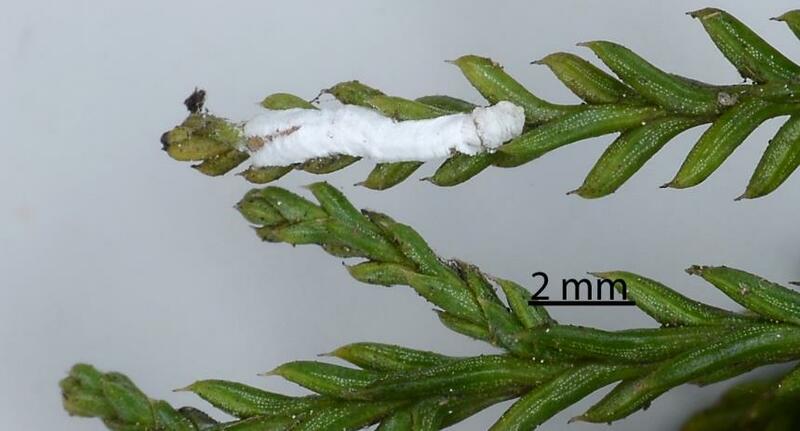 Pupal skin of a predatory hoverfly (Diptera: Syrphidae), on white pine, Dacrycarpus dacrydioides (Podocarpaceae): the syrphid larva may have been feeding on Kahikatea mealybug, Paraferrisia podocarpi (Hemiptera: Pseudococcidae). 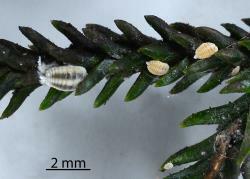 The Kahikatea mealybug is the only mealybug found on Kahikatea, Dacrycarpus dacrydioides and Rimu, Dacrydium cupressinum (Podocarpaceae). Its presence is most easily recognised by the presence of the long white egg sacs on young stems. 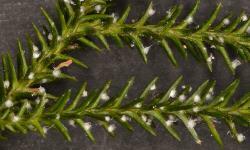 Table: Host plants of the Kahikatea mealybug, Paraferrisia podocarpi (Hemiptera: Pseudococcidae) from Plant-SyNZ database (12 February 2018). The reliability score shows the quality of evidence for the host association (1-10, 10=high). Is there more than one species of Paraferrisia? 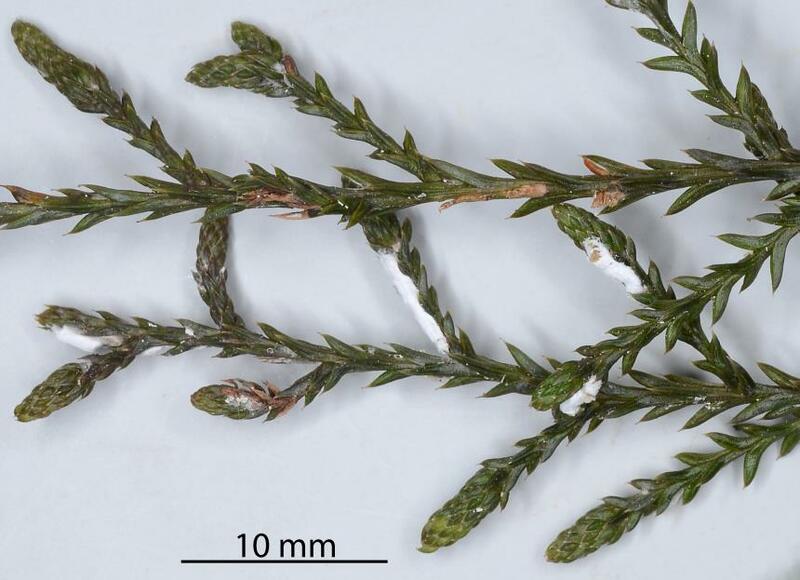 The only known species, Paraferrisia podocarpi occurs only in New Zealand, on two endemic host plants that are in different genera of Podocarpaceae. Both genera, Dacrycarpus and Dacrydium have about 9 and 22 species respectively. 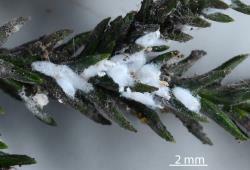 It has been suggested that the mealybugs on Dacrycarpus dacrydioides and Dacrydium cupressinum may be two distinct species. 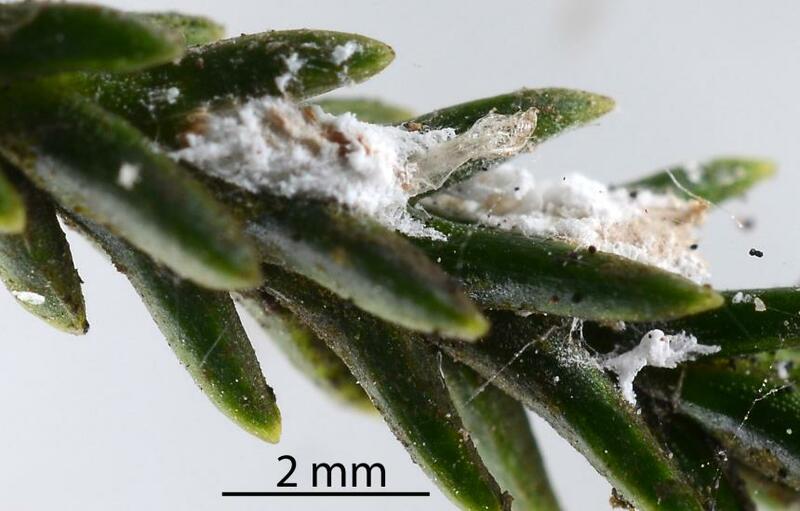 With regards the genus of mealybug being in other countries, it is worth noting that the two genera of trees are present in New Caledonia, a counrty with which New Zealand has strong biogeographic links. Berry JA. 1995. 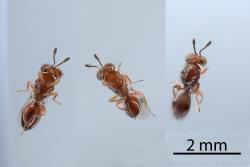 Moranilini (Insecta: Hymenoptera). Fauna of New Zealand. 33: 1-79. 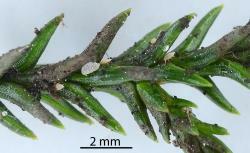 (Ophelosia charlesi, a predator of mealybug eggs is described). Williams DJ, De Boer JA. 1973. The taxonomy of some New Zealand Pseudococcidae (Homoptera: Coccoidea). Transactions of the Royal Entomological Society of London. 125(2): 227-252. (Created genus Paraferrisia). Martin NA. 2018. Kahikatea mealybug - Paraferrisia podocarpi. Interesting Insects and other Invertebrates. 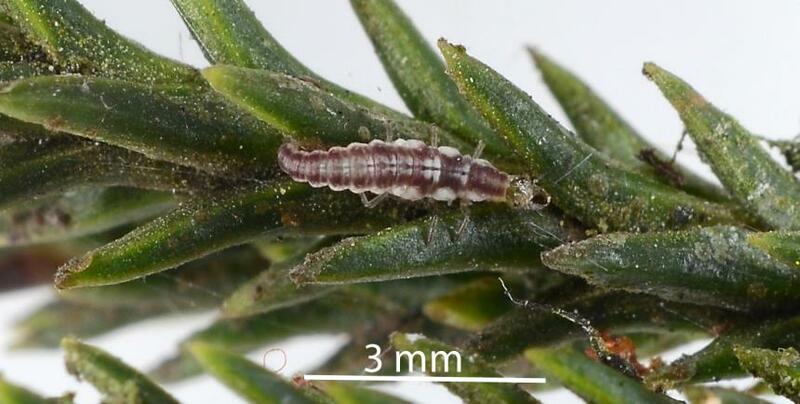 New Zealand Arthropod Factsheet Series Number 126. http://nzacfactsheets.landcareresearch.co.nz/Index.html. Date Accessed. ISSN 1179-643X.